BELOIT, WI - The Beloit Snappers, in conjunction with the Oakland Athletics, are excited to announce their tentative Opening Night roster for the 2019 season. Highlighting the Snappers roster to start the season, will be 7 returners from 2018, 18 newcomers, and 7 of Oakland's top 20 picks in the 2018 MLB Draft. On the mound, the Snappers will return Bryce Conley, Wandisson Charles, Adam Reuss and Brandon Withers. Conley boasted a 3-7 record in 2018 as a starter, striking out 98 batters and staggering hitters to a .213 opponent's batting average. As a hard throwing right-hander, Charles spent the bulk of his 2018 campaign in Beloit, appearing in 11 games and holding hitters to a .158 batting average. Withers ended his 2018 season in Beloit after getting the call-up from Vermont late in the year. In Vermont, Withers dominated the New York-Penn league stifling hitters to a .88 ERA in 30.2 IP. Reuss appeared in only 3 games for the Snappers last year, but had a solid season as a starter for Short-Season Vermont. Reuss started 12 games for the Lake Monsters, while ending the season with an under 4 ERA. Eric Mariñez will return to the Snappers in 2019, this time as a pitcher. Mariñez played for Beloit in 2017, but as a position player. As a hitter, Mariñez hit for a .278 batting average and slugged 24 extra base hits in '17. The Snappers will also welcome a plethora of new arms to the pitching staff this season. Charlie Cerny and Chase Cohen, both drafted within the top -10 rounds of the 2018 MLB draft by the A's, will help anchor the staff to begin the year. Both pitched in Vermont last season with Cerney pitching primarily out of the bullpen and Cohen as a starter. Rounding out the Snappers pitching will be Joe DeMers, Calvin Coker, Bryce Nightengale, Daniel Martinez, Aiden McIntyre, Reid Birlingmair, and Jeferson Mejia who will all help bolster the starting rotation and bullpen. Leading the pitching staff behind the plate will be returner Skyler Weber and newcomer John Jones. Weber played in 63 games collecting 44 hits and 10 doubles in Beloit, while being solid defensively. Weber committed only 3 errors all season and threw out just over 48 percent (38-79) of base runners in 2018. Jones will come to the Snappers after spending 2018 playing for the A's Rookie ball team. Jones hit for a .333 AVG, while slugging 6 doubles and knocking in 14 RBI. For the infield, the Snappers will return Ryan Gridley from 2018. Gridley filled multiple roles around the infield for the Snappers in 2018, but primarily helped anchor down the second base position. At the plate, Gridley hit .269 with 14 extra base hits, while collecting 24 RBI. Adding to the infield will be Marcos Brito who is ranked as the Athletics No. 16 prospect in MLB Pipeline. Brito, just 19 years old, played in 52 games at second base last year hitting .241 with 7 SB and 29 Runs scored in Vermont. Filling out the infield will be two 2018 draftees in Cobie Vance, 18th round, and Nick Ward, 34th round. Also, 16th round draftee in 2017 and 2018 New York Penn League All-Star, Payton Squier, will finalize the infield for the Snappers as we embark on the 2019 season. Last but not least, the Snappers will return Logan Farrar, while adding 3 newcomers, Chase Calabuig, Nick Osborne, and Lester Madden in the 2019 outfield. Farrar returns after a solid 2018 season in Beloit. Farrar appeared in 117 games last year and led the team in Home Runs (12). Additionally, Farrar was 3rd on the team in Runs Batted In (RBI) with 57 and led the team in walks (45). Leading the Snappers in the dugout will be Manager Lloyd Turner who is entering his first season as the Snappers Manager. Joining Turner will be Pitching Coach Don Schulze, Hitting Coach Juan Dilone, Coach Anthony Phillips, Athletic Trainer Brian "Doc" Thorson, and Strength and Conditioning Coach Scott Smith. Fans first opportunity to meet the Snappers players and coaches will be at Meet the Team tomorrow, Tuesday, April 2, 2019. Meet the Team will be at St. John's Lutheran School and begins at 5:30 P.M. Admission for the event is $6, which includes dinner, and tickets can be bought online or at the door. 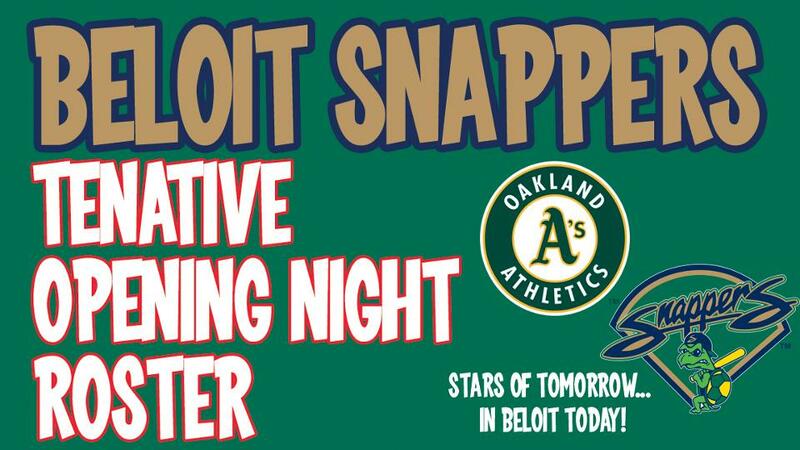 Fans first chance to see the A's Stars of Tomorrow on the field will be this Thursday, April 4, 2019 at Pohlman Field on Opening Night as the Snappers take on the Timber Rattlers. Tickets are available at www.snappersbaseball.com now.